Over a decade ago, I lost one of my closest friends, Anzac Rabbie. He was a talented Papua New Guinean banker who was very well respected amongst his peers and the community. Anzac, named after the famous Anzac Day was from Rabaul. We took Anzac back to Rabaul to bury him. His wife Delma, children Rachael and William and their families who lived in capital Port Moresby, all travelled back to Rabaul for Anzac’s funeral. While we were in Rabaul, the Tavurvur Volcano erupted. It was one of the scariest things I had ever experienced in my life. Anzac’s village was position quite high and inland on a hilltop. However, the eruption shook and destroyed houses, schools and other structures. We were completely covered in ashes. This natural disaster left a very significant memory for me. In PNG we do cover ourselves in some of our regional cultures to show respect for the dead. For the case of my dear friend Anzac, even nature gave him it quite a ‘send off’. Today I read, Tavurvur erupted again this morning. Here is the story from ABC. A major volcanic eruption in Rabaul on Papua New Guinea’s East New Britain Island has left the local community concerned for their safety, as residents flee and businesses close. The eruption came from Mount Tavurvur, which destroyed the town of Rabaul when it erupted simultaneously to nearby Mount Vulcan in 1994. Authorities said the most recent eruption began in the early hours of Friday morning. 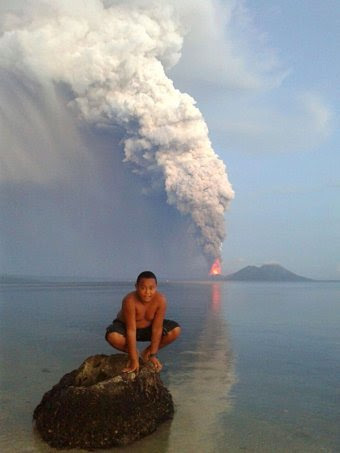 “An eruption commenced from Tavurvur form between 3:30am and 4:00am,” a bulletin from the Rabaul Volcanological Observatory said. “The eruption started slow and slowly developed in a stromblian eruption with incandescent projections accompanied by explosion noises and ongoing loud roaring and rumbling noises. A strombolian eruption is characterized by short-lived, explosive outbursts of fluid lava ejected tens or hundreds of meters into the air. Local resident David Flinn described the eruption of lava and rocks as savage and said lightning strikes could be seen amongst the ash cloud. He said the volcano is currently emitting light steam and occasional booms, with about one centimetre of light brown ash covering surrounding areas. Mr Finn said locals on nearby Matupit Island, about one kilometre from Mt Tavurvur have fled and yachts have left the harbour. Authorities have not yet issued an evacuation order for Rabaul residents. Schools and some shops have been closed, but Rabaul Hotel employee Susie McGrade said locals just want to get on with their lives. “People still live here, we have to get on with our daily lives,” she said. It is yet to be confirmed whether the eruption will disrupt local or international flight plans. Rabaul was the provincial capital in 1994, but after the town was destroyed by volcanic ash the capital was moved to Kokopo. By comparison this eruption is a relatively small event. Mount Tavurvur is considered one of the most active volcanos in the region, most recently erupting in early 2013 and recording other erruptions in 2011, 2010, 2006, 2005 and 2002, since the major 1994 explosion.